Harvest Moon Five Grain Triple Hop is our promising debut and a perfect example of our ambition.An original version of a true Pale Ale. Harvest Moon was first craft-brewed as a “harvest beer” at the end of August 2015 -it was a full moon. We used the best malts and grains – barley, wheat, rye, oats and spelt. The careful choice of Tomahawk, Vanguard and El Dorado hops add a delicate bitterness and a complex aroma. 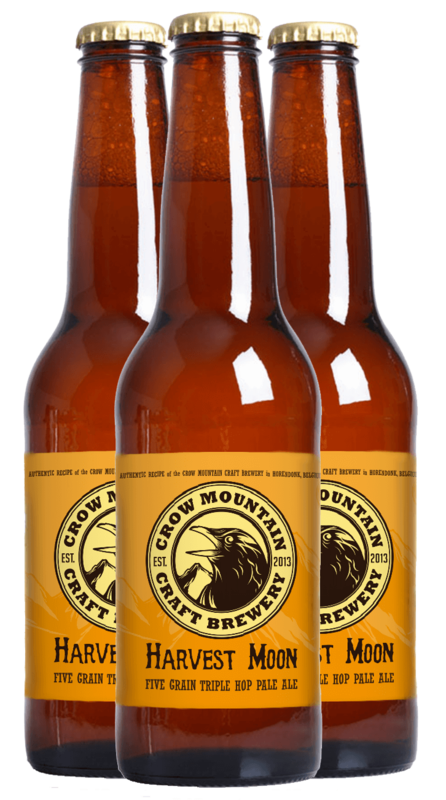 Harvest Moon is an easy drinking pale ale with a bright copper glow.The full-bodied malts and grains provide a balanced basis for the mild Tomahawk-bitterness and spicy fruity notes of the Vanguard and El Dorado dry-hopping. Bottle conditioned, Harvest Moon offers a round flavor and a nice dry finish. 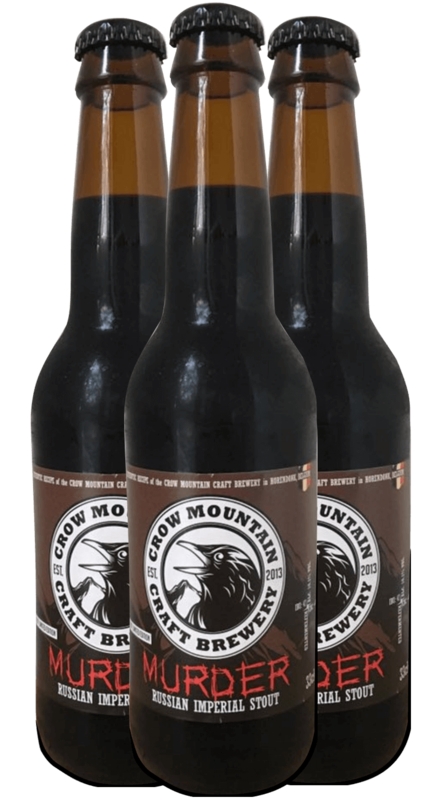 MURDER Russian Imperial Stout is again a true CROW MOUNTAIN-beer. It derives its name from the pitch black color of a group of crows – also called a “MURDER of Crows”. This 2017 Limited Edition is a perfect example of our ambition – to create unique experiences through the passionate brewing of the finest quality craft beers. We have toiled at creating the optimal recipe of exquisite roasted and special malts. The chosen yeast is ideal for Ale beers with delicate aromas and flavors. MURDER is an exuberant Russian Imperial Stout with a pleasant mouthfullness . The very rich malt deposit produces a pitch black color (+400 EBC) and a high alcohol content of 10.1%. MURDER has a full body and remains easy to drink with a nice creamy head. Carefully selected malts bring a complex aroma of roasted grains, fruity esters and alcohol. While the roasted malt character gives hints of coffee and dark chocolate. Supported by the gentle bitterness of Warrior hops , MURDER is in the taste, although intense and complex with coffee, cacao and bitter sweetness, very nicely balanced.